What shall you invade today? It’s not every day an alien invader is sent against his own will to colonize the human home planet of Earth. And it’s not every day that Laughzilla draws about it for The Daily Dose. 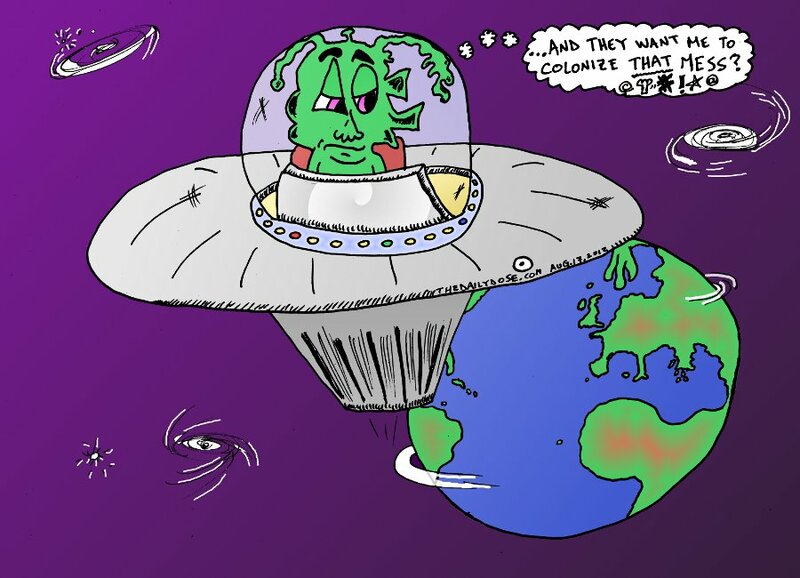 This Colonize Earth cartoon was syndicated on August 17, 2012 for fans of humor here, there and everywhere. Believe it or not, facebook actually tried to legally stop people from using the words face, book, wall and poke. In March 2012 it came to a head as lawyers on both sides fought it out. To contribute art to the cause of those who want to occupy frivolous lawsuits, laughzilla created this face book wall poke cartoon, which is a cover of a book you never reads, including the 4 letter words banned on facebook, even if your friend doesn’t like it. This editorial comic caricature lampoons the occupy frivolous lawsuits movement, with a digital jab to the retina. It was time for the #OccupySilhouette movement to take flight, so Laughzilla helped them do that, with this editorial cartoon, because the top 1% of silhouettes should not own more than half of all the shadows. Keep laughing. It brightens the dark. As March Madness approaches, there are a lot of math and science geniuses who try with all all their skills to calculate the winners and losers of the NCAA basketball championships. This year, 2012, being no different, Laughzilla penned this full color #occupymarchmadness editorial cartoon illustrating the fail attempt by one particular mad scientist on the hardwood court who is sure that he was right, despite failing to make an easy shot to the net. First published on The Daily Dose, along with a list of top ten mad scientist jokes. So it happens that the Gregorian calendar must adjust itself by having an extra day every four years. If not, it would be out of sync with the orbit around the Sun. Of course, it’s not as looney as the lunar calendars that adjust nearly every year, like the Jewish calendar, or those that don’t and just go out of sync, like the Muslim calendar. In any case, this Leap Year, Laughzilla penned this hilarious editorial cartoon for the #OccupyLeapYear movement, which opposes the notion of the top 1% of time controllers, controlling more than half the time of the other 99%. However you count your time, the first time the Occupy Leap Year cartoon appeared was in the February 29, 2012 edition of The Daily Dose accompanied by the Top Ten Leap Year jokes. Eet eez Cold in Paris, Cheri! February is a time of a great lack of heat in the Northern Hemisphere of Planet Earth. Laughzilla considered the Parisians enduring the coldest winter on record and then put forth this Occupy Winter cartoon illustration for The Daily Dose. Made for the #OccupyWinter movement this caricature depicts Winter in Paris with special guest Penguin in Beret, who loves little more than a fresh baguette, a bottle of red wine, and an anonymous journal to read while the Eiffel Tower takes a beating from the cold wind, rain and snow. This cartoon markes a special turn of events, returning full color to The Daily Dose, a feature long left out of the popular web comic strip and joke site.